What do you think about Haglöfs Khione Mid Hood Women? 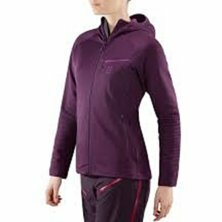 - Warm and comfortable fleece, a good material that keeps the heat in but at the same time leaks out heat if you start to sweat. - just in size, I usually have small in sweaters and I put it in this too, and it was perfectly fitted with underwear. - a functional pocket, it is usually not pockets in such shirts, but it is in this which is positive. There you can put things that you want to keep away from the cold, eg. mobile. - wrong color, since the color does not directly match the jacket and the pants included in the same way. - good with hood, because it can be nice and warm when you take a break from skiing. But the hood can be a bit in the way and when you go skiing you do not have huge use of a hood. One has a helmet on his head and then no hat is needed. It is a very nice fleece with good features. The strengths show that it is a good fleece. However, it is a high price, you can get as good a fleece as this for a cheaper money. Unfortunately, the price lowers the grade, but it is very stylish and functional fleece. So if you want to put this money on a fleece, I absolutely think you should do it.